Once upon a time, I joined a cult. It was a nice cult. We did nice things for strangers, and mass suicides were generally frowned upon. One of the people in this cult was known Joinee Bing. Her real name was Zena, though, and she was very nice to me when I started this blog. I'd even go so far to say that I might have given up on it quite early on without the enthusiasm of a very small number of people, of which she was one. I'm bored. Tell me a story. Please? So as I drifted (slowly) back off to sleep, I started to think of a story to tell her. I set off to work on it the very next day, and emailed her the unfinished story so far. Those of you who know me well probably won't be all that surprised to find I got a teensy weensy bit carried away, and that this story went on for months and months and months. Zena was the perfect little girl. Her bedroom was always neat and tidy, she always behaved impeccably, and she never ever asked for anything. Which was just as well, because her parents never gave her anything. On each of her birthdays, they bought a present for themselves, and although there was always cake she was never allowed to eat any of it. Her parents had decided that the only proper time to eat cake was at ten o'clock at night, long after Zena's bedtime. On her first birthday, Zena received a new washer for the kitchen tap. On her second birthday, she received a pair of tickets to the opera. On her third birthday, she received a new winter coat for her mother. On her fourth birthday, [see second birthday]. On her fifth birthday, she received a week's cottage break (for two) in the Cotswolds. 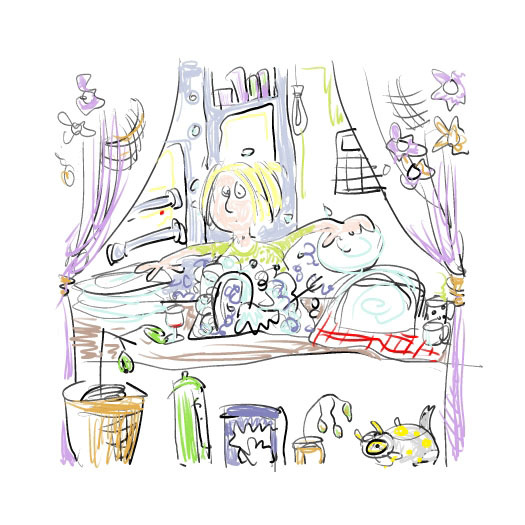 While her parents were away, Zena washed all their clothes (as usual), she cooked herself dinner (as usual), and she went to bed at the correct time. As usual. Her birthday cake remained in the cupboard and began to develop its own healthy layer of mould. Zena's sixth birthday, however, changed everything. All of her other presents had come in very small boxes indeed, but not this one. On her sixth birthday, the box was bigger than Zena herself. Something then happened that had never happened before: Zena began to become excited. I didn't like to say, for I did not want to appear uncharitable, but I am sure you must have guessed already. Zena really was a very boring little girl. She never became excited about anything. I meant I want to illustrate it it, ha, ha. Oh, you can if you like, Rosie. Be my guest! I can forward you the story by email. I did wonder whether that was what you meant.